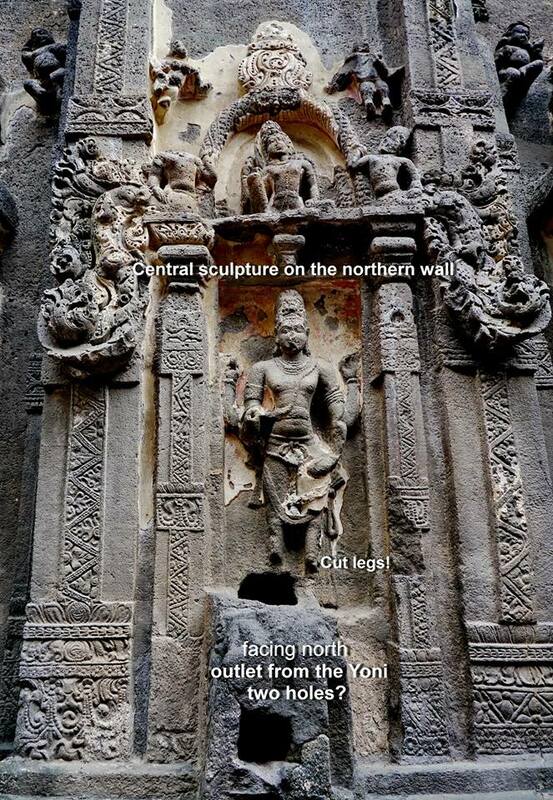 There are many unanswered questions surrounding the Kailash rock-cut temple in Ellora. This post addresses one of those questions. I analyse the mysteries surrounding the waterspout or praṇāla of the main sanctum or garbhagriha.I don’t offer any answers this time. Just a detailed analysis of the material. The Kailash is a temple carved in the tradition known as Dravida which is the dominant architectural form in South India. It is thought to have received its present form during the medieval period although there is no information available to actually date it. One inscription connects it to king Krishnaraja I of the Rashtrakuta dynasty and the 8th century CE. 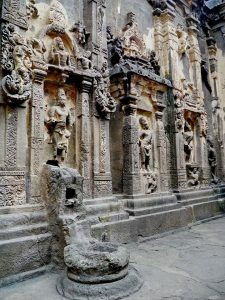 There exist puranic references to a King Ela or Aila of Achalapur and his queen Manikavati being the moving forces behind the carving of this enigmatic temple. Today we also don’t know to which deity this temple was dedicated. Today Its name is the Kailash. This is the name of the sacred mountain in the Himalaya which is Lord Shiva’s residence. 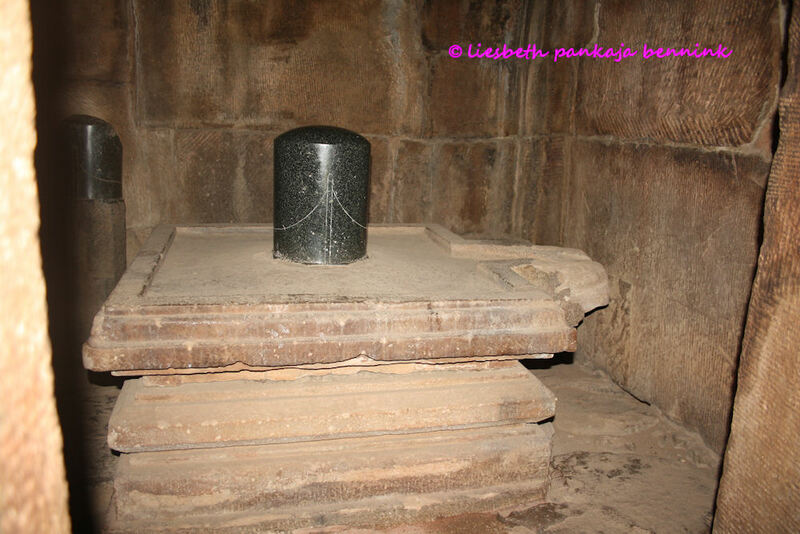 The garbhagriha or sanctum holds a large Shiva Linga. But this is known to have been (re)constructed by the archaeologists. The nashi of the vimana, that is the barrel-shaped pavilion jutting out of the pyramidal roof, contains a relief of a seated 8 armed form of Shiva. The attributes in his hands would offer a means of identifying this particular Shiva. These are: the lower front arms show Abhaya-Varada mudra. Fear not and Wish-fulfilling. The other arms on the right side show (lower to upper), one hand missing, a rudrakshamala (rosary), and a naga-snake. On the left side, also one hand missing, one object not clear from this side (on checking with another photo I think it is a pasha, the noose), and a lotus. So far the search for the identity of the particular for of Shiva has not led to any clear results. The cobra and rosary are well known attributes of Shiva. But the lotus is possibly unique in this case. 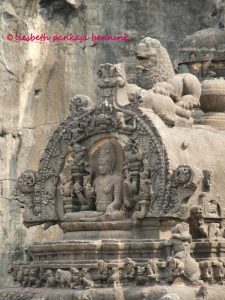 The temple faces West, which may indicate a connection to the Death-slaying aspect of Shiva, who is also connected to Sacred Time, Mahakala, or Kala Samhara murti. But the attributes in Shiva’s hands on the nashi, especially the lotus in the upper left hand, do not confirm this connection. Central niche with Brahma and waterspout. Credit Christel Pilz. 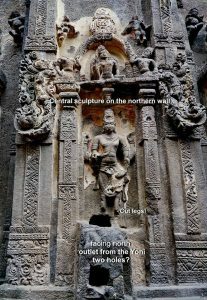 Under the central niche of the North-facing wall there is a praṇāla or waterspout. 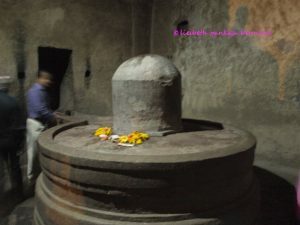 Its function is to allow the run-off liquids used for the abhishekam or ablution of the Shiva Linga in the sanctum to exit the sanctum and become available to the worshippers in the prakara or courtyard. The architectural tradition allows for several forms. Makara Mukha (crocodile face, Go-Mukha (cow-face), Gaja Mukha (Elephant Face). This is a standard feature of Dravida temple architecture. The Northern central niche is occupied by a relief of the god Brahma. This too is standard. But there are several peculiarities to the structure. The waterspout is not placed symmetrically in the center of the niche. It is situated on the edge of the niche. Slightly off towards the East/right. The spout itself is not symmetrical, and it seems to be damaged. It is not possible to make out its proper shape, although the wavy forms may indicate it was a makara type praṇāla. Actually the Brahma sculpture is badly damaged as the legs are cut off at the knees. The spout has two square water mouths on the outside. One at the top, and one at the front. The upper one looks like it could be a damage or a later adjustment. It is not in the normal place and it is situated where the feet of the Brahma would have been originally. A kind of small channel from this upper mouth has been cut in the top of the spout. As the rest of the temple this whole looks to be part of the original rock. I had an extra good look to make sure. But there has been damage that has been repaired with some cement material. This praṇāla originates from within the sanctum. 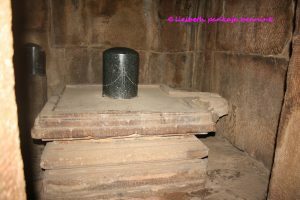 The Shiva Lingam is relatively large and looks a bit rough when compared with similar Lingams from contemporary temples. All the in the texts prescribed ritual markings and pramana or proportions seem to be missing. The shape of the shaft is rough and uneven. The yoni part is well constructed but seems to be made of granite. 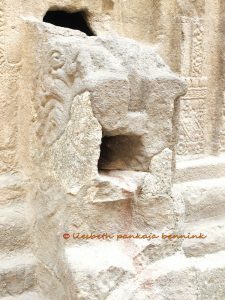 This means it is not part of the original basalt rock from which the Kailash temple was carved. 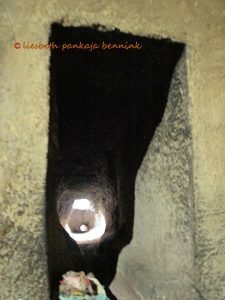 This confirms what I heard from Christel Pilz, that the Lingam was (re)constructed by the ASI. This means unless the ASI can give researchers access to their photo archive we can’t draw any conclusions about the kind of worship that took place here. I assume the ASI made a photographic record of the existing situation, as would be the normal archaeological practice. The exit of the praṇāla is roughly but not perfectly rectangular. This imperfection in itself raises questions about the original construction. When we look through the flow channel we see the large upper hole have a lot of light falling into the channel. The flow channel itself is rough and uneven in shape. And the round hole leading to the lower mouth is placed asymmetrically on the right side of the channel. From the inside it is clear the whole structure belongs to the original rock. The roughness and imperfection do point to a secondary construction. Why is the pranala out of symmetry? Why were Brahma’s legs cut? Why such a small basin? What was the original murti in the sanctum? And what was the ritual used to worship this murti? Alas I cannot offer any answers at this moment. I hope these questions can help researchers focus their efforts in future. I recommend concentrating at texts and manuscripts for further research efforts. Very many thanks for this analysis, the first ever done on the watersprout, the 2 holes etc. Who can give properly reseached answers? Very informative article. Well researched. Many points worth pondering. Look forward to fruitful discussion.